The Oklahoma City real estate market continues to endure (and hurdle through) a cluster of highs and lows in 2016. The first-half of the year saw sub-par home prices and appreciation rates for Oklahoma City real estate, with prices vastly below the national average. Slowly transforming into a seller’s market in the first-half, the Oklahoma City real estate market is composed of an assortment of investing opportunities for the taking in the second-half of 2016. Homes purchased in the Oklahoma City, OK housing market one year ago have appreciated, on average, by $1,180. The national average was $14,963 over the same period. Homes purchased in the Oklahoma City, OK housing market three years ago have appreciated, on average, by $13,644. The national average was $46,878 over the same period. Homes purchased in the Oklahoma City, OK housing market five years ago have appreciated, on average, by $22,978. The national average was $82,353 over the same period. Homes purchased in the Oklahoma City, OK housing market seven years ago have appreciated, on average, by $30,810. The national average was $77,054 over the same period. Homes purchased in the Oklahoma City, OK housing market nine years ago have appreciated, on average, by $41,696. The national average was $31,126 over the same period. Total equity gains for the Oklahoma City real estate market remained significantly behind the national average in the second quarter. In fact, the last nine years have witnessed meager equity gains for Oklahoma City real estate, with only gains from year nine ($41,696) outpacing the national average ($31,126). Additionally, homes purchased in 2005 have earned equity gains of $59,610, compared to the rest of the country of $34,380. As of October, the Oklahoma City real estate market has 1,570 properties in some stage of foreclosure, according to RealtyTrac. The number of foreclosed properties in Oklahoma City fell 16 percent from the previous month, and 46 percent from the same time last year. However, while the percentage of foreclosures is down, the number of bank owned homes is up. The number of REO properties in October was up 22.5 percent from the previous month, while REOs increased 50 percent compared to last year. That said, Oklahoma City real estate investing could experience a significant increase in the coming months. Growth for the Oklahoma City real estate market remained stagnant in the second quarter of 2016. The median home price for Oklahoma City real estate was $154,900 during the second quarter, compared to the national average of $239,167. Appreciation gains have also been severely below the rest of the country. The second quarter witnessed one-year appreciation rates of -0.9 percent and three-year rates of 3.9 percent for Oklahoma City real estate, which is poor and needs to improve. Although home prices and appreciation remain slow, home affordability for the Oklahoma City housing market remains strong. Homeowners paid 6.6 percent of their income to mortgage payments during the second quarter, whereas the national average paid 15.8 percent. While Oklahoma City is historically one of the more affordable markets in the country, home affordability further improved in Q2. In fact, Oklahoma City continues to be one of the top markets to be a landlord for short-term, month-to-month profitability. One factor that could hinder affordability in Oklahoma City is new housing construction. The second quarter saw construction reach 29.3 percent above the long-term average, while single-family housing permits fell to -3.9 percent. Although construction is down from last year, it appears to have bottomed out. That said, new housing construction in Oklahoma City could see improvements in coming months. The biggest influence on the Oklahoma City real estate market in 2016 has been the local economy. Unemployment has risen since the same period last year, while employment growth continues to ease. The current unemployment rate in Oklahoma is slightly below the national average, settling at 4.7 percent compared to the rest of the country at 4.9 percent. One-year job growth, on the other hand, remains paltry in comparison to the national average. New jobs in Oklahoma City grew at a rate of 1.1 percent during the second quarter, compared to 1.9 percent. That said, the local economy in Oklahoma is poor and needs to improve. For Oklahoma City real estate investing, foreclosures remain a bright spot for potential investment opportunities. There were 1,588 properties in some stage of foreclosure during the second quarter. Although the percentage of foreclosures in Oklahoma City is down from last year, the number of REO properties is increasing. This combination of factors, combined with low home prices and appreciation rates, could spell opportunity for those considering investing in Oklahoma City. Moving forward, the Oklahoma City real estate market is forecasted to experience weaker price growth in the next 12 months. 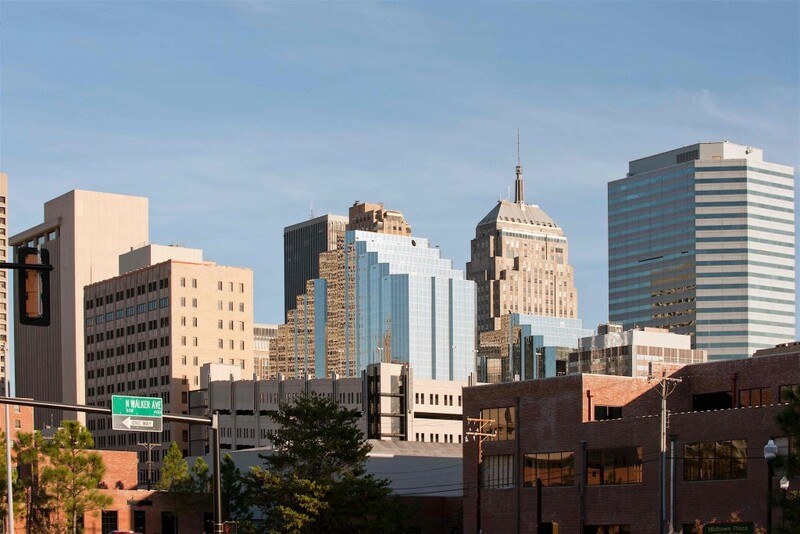 According to the National Association of Realtors (NAR), Oklahoma City real estate is expected to grow by 2.5 percent, compared to the national average of 3.6 percent. Although more modest than a year ago, the Oklahoma City real estate market should see a plethora of investment opportunities in the second-half of 2016.